It is your bathroom. Elegant, modern, designed with a unique, original touch, to reflect your lifestyle. 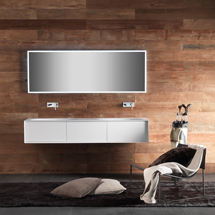 It is made up of furniture, washbasins, bathtubs and accessories, designed and created one by one, lacquered, sized and layouts arranged according to my needs. It is the fruit of an Italian company encompassing all the values of a family, of the work of designers,creators, architects and artisans who infuse their own unique identity into each item, an energy that translates into shapes and proportions that make each product an instant classic. It takes the spotlight in any contemporary scene that makes elegance and originality its distinguishing features. It is Falper.